The mission of the diocesan Archives is to collect, organize, preserve and (when possible) make available for research the historical and vital records of the Diocese of Burlington, as well as the materials which reflect the work of the Church within the Diocese to promote an understanding of and cultivate an appreciation for the Catholic Church’s history and heritage in the State of Vermont. In addition to caring for events of the past, the Archives exist to ensure that diocesan acts created today are preserved for future generations. The Archives are staffed from 8 am to 1 pm on Tuesdays and Wednesdays. Please contact the Archives via email outside regular hours. What are the Diocesan Archives? The Archives of the Diocese of Burlington contain historical materials pertaining to bishops, the chancery, parishes, diocesan offices, institutions, personal papers, audiovisual materials and photographs as well as a large collection of relics that are available to be borrowed by parishes for veneration. The Diocesan Archives are a service organization that exist first and foremost for their institutional usefulness to the administration of the Roman Catholic Diocese of Burlington. Therefore, it is the primary purpose of the archival function to assist the Bishop, Chancery, and all offices and agencies of the diocese with the information necessary to fulfill their responsibilities. 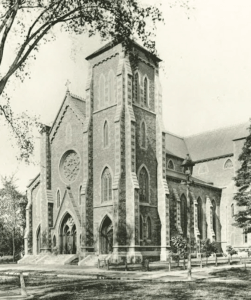 Learn about the history of the Diocese of Burlington. The diocesan Archives serve as the repository for the historical and administrative records of the Diocese of Burlington. These records are arranged in specific collections such as the records and papers of bishops, Chancery offices and consultative bodies, historic records of parishes and schools and sacramental records. Each of these collections contain various records which may include photographs, audiovisual material, printed parish histories, programs from significant diocesan or parish events, maps and blueprints, artifacts and works of art. Currently, the Diocesan Archives are not open for public research. Please contact the department if you are interested in learning more. All current sacramental registers are retained at the parish where the sacrament took place. An individual seeking certified copies of one’s own record from an active parish should contact that parish. For contact information for the active parishes of the Diocese of Burlington, visit the parish directory. Should an individual be unsure of the parish where the sacrament took place, contact the diocesan Archives by completing this request form. Orphanage records of former institutions are generally maintained in the office of Vermont Catholic Charities. These records are not available for genealogical research by phone or in person, but by written request with a valid photo ID via email or postal mail. The Archives repository makes the heritage of the Diocese of Burlington available for historical researchers within the guidelines of the canon, civil, and diocesan law. The Archives staff views genealogical research as a legitimate and important effort in assisting individuals to place themselves and their families within the context of the history of the church in Vermont. The archivist will assist researchers within the constraints of available resources such as financial, equipment, space, and staff. Sacramental records for the Diocese of Burlington begin in 1830 even though the Diocese of Burlington was established in 1853. Individuals seeking sacramental records for genealogical research will not receive certified copies of records. Rather, the Archives Department will provide names, dates and places where sacraments (baptism, marriage, burials) took place, if the records can be located. A copy of the original record will not be provided. Members and volunteers of the Vermont French-Canadian Genealogical Society began a sacramental records preservation project in 2004. To date, original records from nearly all Catholic parishes in Vermont, dating from the beginning of each parish to about 1997, have been transcribed and compiled into parish directories. An index has been created and is available for research. If you are interested in researching additional historical information pertaining to particular interests in genealogy, the Vermont French-Canadian Genealogical Society provides additional online resources for genealogy research. Look for #FromtheArchives articles in Vermont Catholic Online News and posts on diocesan social media accounts by following @DioBurlington on Facebook, Twitter and Instagram.